React Native Vancouver: April Talk Night - A.Y. Technologies Inc. 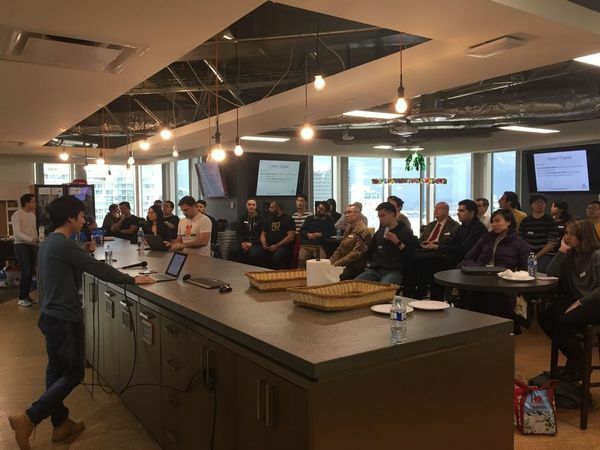 This Tuesday we had our React Native April Talk Night at BuildDirect’s office in downtown Vancouver. We had 100 people RSVP for the event and we had a great turnout. We had a 2 hours packed event. He finished his talk by introducing Renderless Components and how they can allows us to create a component that automatically cleans itself when the parent component unmounts. If you are interested, here is Eric’s presentation deck. Presented by Mateo Barraza, we learned more about steps you need to take to be able to integrated your React Native app with iOS Native modules. He divided the process in 7 different steps and showed us the process step by step. Using the bridge view registry when dealing with multiple views. Lightning talks are always exciting. 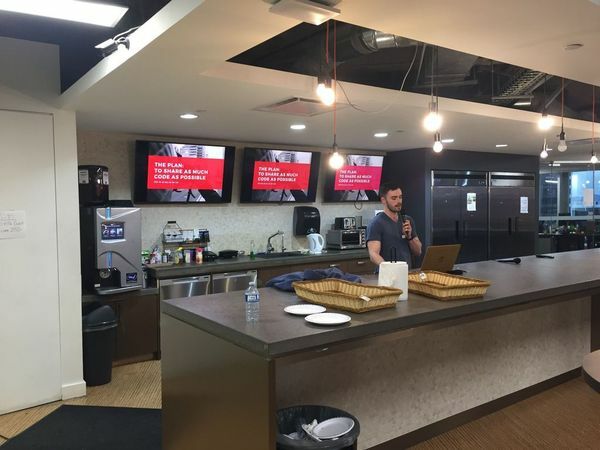 We had 3 lightning talks that were very engaging and not only showed us how the community is doing in Vancouver, but also give us more insight on how we can use React Native the best. Stephen Laughton talked about how Invoice Simple is taking the incremental adoption route to use React Native. How showed us their approach, challenges they faced and how they overcame those challenges. He also talked about next steps in their approach and what they expect next. We had a special guest presented in our meetup: Sunki Baek joined us from Korea. He talked about best practices of using React Native and MobX. Scott Domes talked about how MuseFind is using React and React Native and how they approached code sharing between the two. He told us about the common issues you would face when approaching this problem and what they learned so far. We are still in the process of scheduling next Hack Night in May and next Talk Night in June. We will post the links to those at the bottom of this post as well.